A Busy Summer for 2012: Ready, Set, CALENDAR! Thought you’d have the summer off from theater, music and performance this year? HAH! This summer is shaping up to be the most busy and FUN summer in recent history. Here are just a few items which you can plan for. Metblogs should be at all these events, so if you can’t make it we’ll tell you about the fun you missed! Don’t let it come to that… Put these events on your calendars now! Time is running out to see this show that Kathleen Normington, Professor of Theatre at SJSU, called “brilliant and achingly touching”. Metblogs sadly had to miss this show, but all the reviews have been raving. One need never live without opera in San Jose. OSJ has posted their Summer Concert Series schedule on their Facebook page, and if you haven’t clicked LIKE yet, you’re missing a lot of great deals. A couple years ago the We Players put on an amazing live Hamlet at Alcatraz. This summer it’s a live action The Odyssey on Angel Island. Metblogs will be there June 16 and this is one of the shows we’re most excited about. Missing the Alcatraz Hamlet show is something I’ll regret forever, I’ll not make the same mistake twice! We’re so excited we’re going to read The Odyssey one more time before we go! It’s like Cirque du Soleil with horses! Go to the website and check out the videos. I can’t imagine a more beautiful show. We’ve checked out the word on animal treatment and they appear to get the highest marks possible, so you can have a guilt free enjoyment of some of the most beautiful horses in the world. Some packages even allow for a tour of the stables after the show! Tickets go on sale June 3. Last summer at San Jose Rep, Ross kept audiences laughing with his solo take on the Star Wars trilogy. This time in One-Man Lord of the Rings™, Ross shoehorns 11 hours and 23 minutes of Peter Jackson’s epic films into a 70-minute show packed with 42 characters, theme music, and sound effects. Metblogs was there last summer and it was the most frenetic 90 minutes we’d ever lived through. We wouldn’t miss this show for the world and you shouldn’t either. Posted in Bay Area, Entertainment, Music, Outdoors, Parks, Performance, Theater | Comments Off on A Busy Summer for 2012: Ready, Set, CALENDAR! The Guadalupe River Park Conservancy, the City, and a variety of sponsors interested in environmental issues put on a nice event today: Spring in Guadalupe Gardens. This was a great chance to enjoy spring weather, maybe pick up a few new plants for the garden, and see how the park is developing. For people with kids there were a bunch of booths with educational presentations on recycling, water conservation, and other environmental topics. On top of that, there was live music and other fun activities. In case you missed Cloudy with a Chance of Meatballs a couple of weeks ago at Muni Stadium, there’s another chance to see it free under the stars tomorrow night. The 13th Street Neighborhood Advisory Committee will show the film Tuesday, August 3rd, at Backesto Park, near the corner of 15th and Jackson Streets in San Jose. The event starts at 6 p.m., with free hot dogs, chips, and soda for the first 500 people. Film time will be around 8:30. The show is part of National Night Out, an annual event meant to bring out communities to meet their local police departments and participate in public safety. Other neighborhoods around town will be having a variety of National Night Out events, so keep your eyes open, and consider dropping by. History San Jose and the Victorian Preservation Association of Santa Clara Valley (VPA) are holding a grand opening this Sunday for the Andrew P. Hill House at History Park. The house was the home of Andrew P. Hill, a San Jose resident and co-founder of the Sempervirens Club, which was responsible for the creation of California’s first state park at Big Basin in 1902. The house was moved from its location on Sherman Ave in 1997, and underwent restoration led by the VPA over the following 12 years. VPA also collected period artifacts and items from the Hill family to exhibit in the house. The house was opened to visitors in April, 2009. The grand opening event will feature a ribbon-cutting, antique cars, tours of the house, and costumed actors. It runs from 1 to 4 p.m. on Sunday, July 25. History Park is at the south end of Kelly Park, on Senter Road, near Alma Ave. I just got back from tonight’s Music in the Park. I didn’t go for The English Beat, what I wanted to see was the local punk band, The Odd Numbers. They gave a great show, and they got a great response from the crowd. Their show was mostly original numbers, but they did include covers of songs by the Kinks, Elvis Costello, and The Who, which give a an idea of the band’s style. Two of three bocce courts at Backesto Park have been restored. The Northside Neighborhood Association celebrated recent improvements to the bocce courts at Backesto Park with a bocce lunch party yesterday. Unfortunately the event was scheduled before the US made it in to the World Cup round of 16, playing at exactly the same time, which might partly explain the modest attendance. The Luna Park Business District, composed of businesses located along North Thirteenth Street in the Northside, held a mixer event at the bocce courts on Friday. The Luna Park businesses, especially Chiaramonte’s Deli, have made significant contributions to recent work on the courts, and have volunteered to help with future maintenance. Chiaramonte’s also provided lunch for the NNA event yesterday. After the courts were threatened with removal due to underuse, as we reported in April, a group of volunteers from the Northside got together to restore the courts and make them playable again. Two of the court surfaces were cleaned up with a new layer of crushed oyster shells, and sun shades were erected over the two ends of one of the three courts. All in all, NNA president Chuck Hagenmeier estimates over 100 volunteer hours went into the project. The results are impressive. Courts that had been weedy, cracked, and flaking are now as smooth as a slate pool table, and eye-searingly white and clean. New users such as a Special Olympics group are coming forward, and the improved court surface should make the courts more appealing to casual pick-up players. 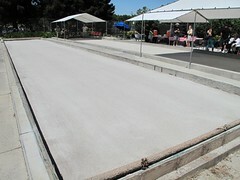 The courts are available for use by the public at no charge. The keys to the courts and a set of balls can be borrowed from the nearby Bronco’s Mexican Restaurant or Chiaramonte’s Deli, with the deposit of a drivers license or credit card, during regular business hours.